What Does the State Flag of Iowa Look Like? 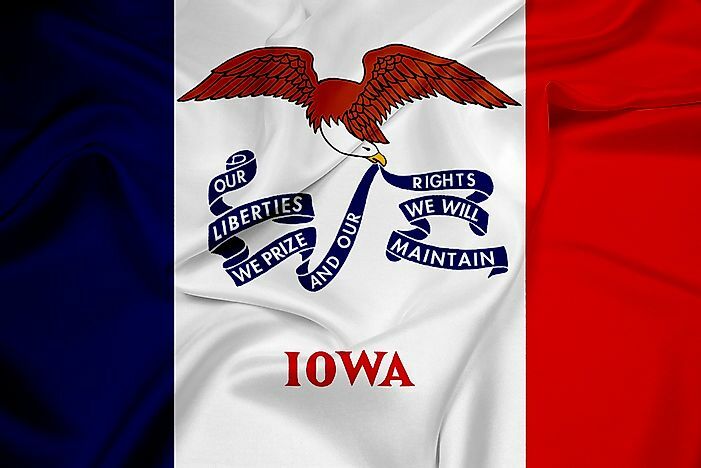 The state flag of Iowa was adopted in the year 1921. The state flag of Iowa. The Iowa State flag dates back to the year 1921. The flag is composed of the colors blue, white, and red, with the image of a flying eagle in the middle. The federal eagle holds a ribbon on its beak with the words “Our liberty we prize and our rights we maintain.” The designer was of the view that the flag should incorporate the past struggles and glories, the present path, and the future discoveries of the state. The rectangular flag has a dimension of 2:3 and is composed of three colors running vertically. These are white in the middle and blue and red on the hoist and fly respectively. The white color, which occupies the largest portion of the flag, symbolizes the purity of the state’s history when the ancient occupants lived peacefully and in harmony. The blue color portrays justice as well as Iowa's loyalty to the United States. Red signifies the courage of the state's residents. Though the State of Iowa was admitted to the State’s union in December 1846, it remained without a flag for 75 years mainly because the government felt that the main flag of the US identified and represented them appropriately. The Iowa State flag was designed by Dixie Cornell Gebhardt, a resident of Knoxville. She emerged the winner in a competitive process by the Daughters of American Revolution who presented various designs to the State Council on Defense. The competition was held in May 1917 during the First World War when the soldiers from Iowa felt that they needed a needed a flag to identify with. After the adoption of the design, the several pieces of the flag were produced and dispatched to the various units of soldiers across the world. The state officially adopted the flag in 1921, after the first world war. What Does the Cuban Flag Look Like? What Does The Pan-African Flag Look Like?